Thunder Matt's Saloon: Thunderwatch 2009: Murton Goes Yard! Finally! Last night Thunder Matt hit his first MLB home run since 'Nam. 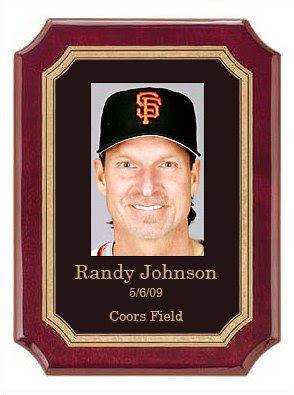 The single run shot came in the 5th inning off Randy Johnson. Of course this means we get to add the Big Unit's mug to the Thunder Matt Trophy Room. Since it's been nearly two years since I've had to add a new plaque I wasn't able to locate the old template I used. So instead I've created a new plaque that will be used from now on.